The Toshiba 50L5200U makes an excellent solution as a wall-mounted, everyday watching TV and the price ain’t too shabby, either. Toshiba L5200U Series information: This review is based on our hands-on experience with the 50-inch Toshiba 50L5200U TV. However, our observations also apply to the 40-inch40L5200U and the 46-inch 46L5200U. According to Toshiba, the three sets differ only in dimension and weight and offer identical features and performance. Here’s the scene: You walk into the TV section of just about any big box store that carries electronics, and quickly learn that a 50 to 55-inch LCD TV can be had for anywhere between $650 and $850. Amazing, isn’t it? But here’s the rub (there’s always a rub): With the exception of some plasmas, the TVs that can be had at this low price point are usually from brands you’ve either never heard of or don’t trust. It then occurs to you that purchasing a large TV is a rather significant investment and that it might be worth a couple of extra bucks to go for a trusted brand that routinely earns solid reviews. Naturally, then, you take a look at the price tags on the similarly sized sets from well-reputed manufacturers only to discover that the premium name comes with an equally premium price; in some cases, up to double that of the least expensive set from an “off-brand”. Suddenly, this whole “TV-buying thing” just got a lot more complicated. You begin weighing options in the aisle; then you start to debate yourself. Next thing you know, you’re walking out of the store without a TV because the right combination of price, size and brand didn’t strike you. We think Toshiba had that sort of scenario in mind when it designed and built the 50-inch 50L5200U TV; it’s an LED-edgelit TV that promises superior picture quality from a brand you recognize and trust, all at a price you can live with. In theory, it’s a really sweet proposition, but the question that remains is: Does the Toshiba 50L5200U really bring with it the Toshiba pedigree that promises superior picture quality, or is it just an attempt to get us comfortable enough to open our wallets and lay down some dough? Read on to find out where we think this TV stands against others in its price and size class and whether this model should be on your short list the next time you shop. When it comes to reviewing TVs, our immediate, out-of-box impressions can sometimes be misleading. In some cases, what emerges from the box is an ultra-modern looking display with clean lines, fancy trim and a pencil-thin profile, but when it comes to performance time, we’re less than bowled over. In some cases, we experience the opposite. With the Toshiba 50L5200U, however, our immediate impressions tended to stick with us during the course of our evaluation; a fact that would end up making our review process a little more complicated. One of the first things you pull out of the box (if you’re the sort to follow instructions) is the TV’s stand. The stand, though attractive enough from a distance, is made of pretty cheap-feeling plastic. While its glossy black finish is easy on the eyes, it has an inexpensive feel that makes it hard to get too excited about digging into the rest of the box. We then pulled out the remote, which only served to reinforce our initial feelings. It looks dated by today’s standards and had us wondering if this TV was actually one of Toshiba’s lower-tier models. Pulling the panel itself gave us a little encouragement. 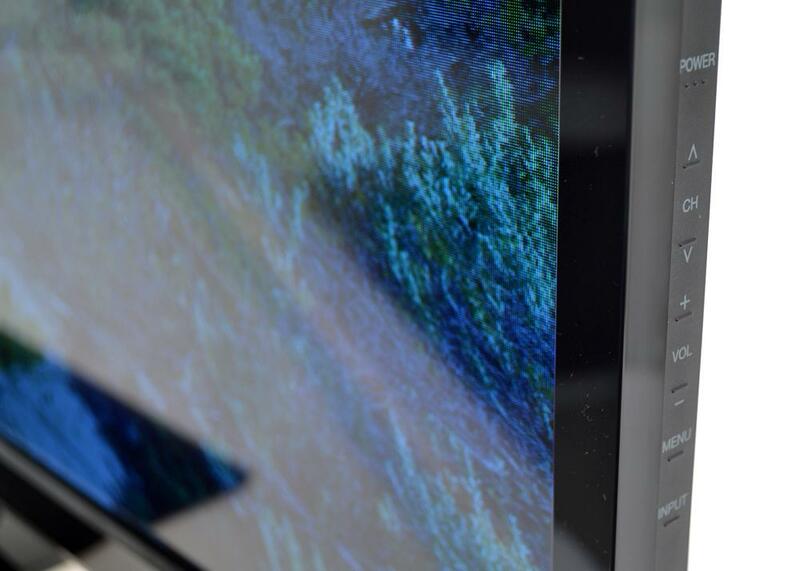 Its profile is impressively thin and the bezel, while not nearly as thin as Toshiba’s own flagship models or that of Samsung’s, LG’s or Sony’s, is still thin enough to clue you into the fact that this is a relatively new TV. Our complaint with the bezel is the material it is made from. The complaint isn’t that the bezel is made of plastic — which is actually quite common — the issue we take is with the quality of the plastic material which, like the stand’s base, looks good but feels flimsy. The 50L5200U measures 44.8 x 26.9 x 1.8 (H x W x D in inches) and weighs 39.6 lbs. without its stand. Looking at the feature list of the 50L5200U, it becomes clear by way of some notable omissions that Toshiba’s goal with this TV was to keep costs down by holding back on some of the frilly stuff. There’s no Internet connection for streaming media, no 240Hz motion smoothing (no loss there, as far as we’re concerned) and no 3D capability. All of the aforementioned features are reserved for Toshiba’s 7200 series (which, by the way, look gorgeous). 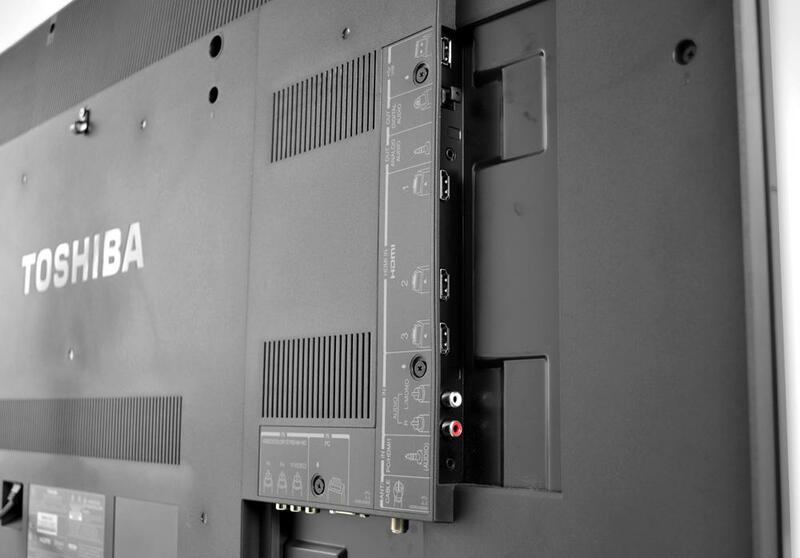 What you get in terms of connectivity are three HDMI inputs, one component video input (which doesn’t require a break-out cable, thanks, Toshiba), PC input, USB input, analog output and digital optical output. The set features Toshiba’s Dynalight technology; that’s Toshiba-speak for local backlight dimming. The intention is to increase contrast capabilities so that dark areas of the screen are darker and bright areas are brighter. For audio, the 50L5200U boasts Audyssey processing that includes, among other things, “EQ” (bass and treble only) and automatic volume control. 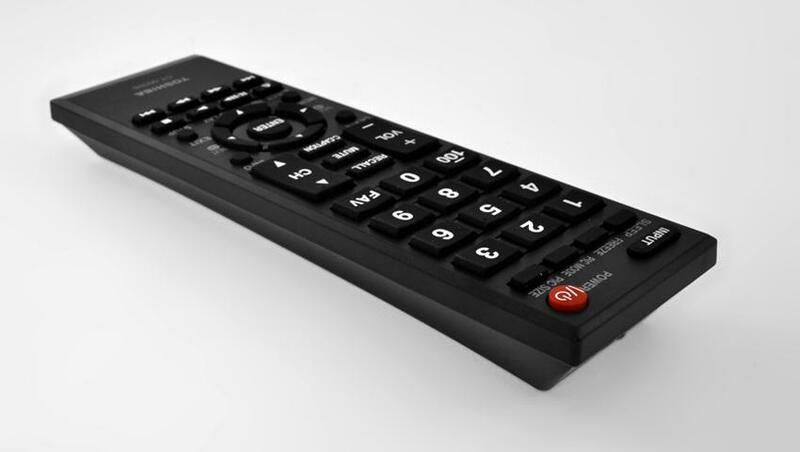 We mentioned earlier that this TV’s remote control looks a bit dated — and it does — but the truth is that its simplicity will probably be an advantage for those who will actually use the TV remote, rather than the one that goes with the cable box. The buttons are large, easy to find and easy to press. Having the numerals located at the top will be helpful for surfing over-the-air channels. Unfortunately, it isn’t backlit. In our opinion, every remote should be backlit. There oughta be a law! Thanks goodness Toshiba provides an easy-to-use remote, because the operational buttons on the side of this TV are next to worthless. They are difficult to describe, but we’ll do our best. Think of them as touch capacitive buttons, but just slightly raised so that you think you need to press them in for them to work. Also, they’re tiny and difficult to distinguish; plan on having a flashlight and some reading glasses nearby if you ever want to use these buttons. The 50L5200U benefits from some calibration. Thankfully, Toshiba provides plenty of control over the image, from the rudimentary, to the advanced sort of settings that are best left to professionals. We were able to get great performance from this set with some basic adjustments. We provide the settings at the end of this review for those that want an express trip to happy TV time, but if you want to try your hand at calibrating, check out our guide on the subject. With calibration complete, we threw some test patterns at the set to analyze its performance from a more objective point of view. We were impressed with what we saw. The 50L5200U was able to produce both whiter than white and blacker than black test bars, indicating that it isn’t clipping the source signal. If properly calibrated, this set should be capable of impressive shadow detail and shouldn’t “crush” blacks as lesser quality TVs tend to do. With the picture size set to “native” the TV resolved the entire image that was presented to it without chopping off any vertical or horizontal edges. Color seemed well balanced and vibrant, though it was clear that a professional calibration would probably yield more “accurate” color if desired. The only notable issues we pulled from these test patterns came in the form of some low-bandwidth luminance anomalies (nothing disconcerting), some motion judder and some jagged lines (anti-aliasing issues). Of course, since most folks don’t sit at home viewing test patterns at length (not as far as we know, anyway), we moved on to some more subjective evaluations by watching some familiar HD content. First, the good: The Toshiba 50L5200U showed us some especially good contrast performance. In fact, black levels, brightness and contrast were some of the best we’ve seen from a set that didn’t involve full-array local dimming. We watched several scenes where stars broke up an otherwise jet black background and were impressed to see almost no bleed around the tiny pinpoints of light. We were also satisfied that the display was able to pull off such solid contrast performance while maintaining balanced brightness across the entire screen. We saw almost no light bleeding from the edges of the set, either; extremely impressive considering this is an edge-lit set. Color output on this set is enthralling. Aside from the fact that red colors can look a little hot from time to time, we felt the color was vibrant, deep and, for the most part, accurate. As we moved from vividly colored images to more muted video footage, we noticed that the 50L5200U didn’t artificially boost the color. Images looked genuine and, because of that, very real. On the whole, we think the 50L5200U looks outstanding — particularly for everyday viewing — but there were a few performance issues that revealed the fact that this isn’t Toshiba’s top-of-the-line TV. First, this set seemed to have some trouble smoothing out jagged edges that would appear along long, straight lines. In some cases, it took away from the otherwise highly detailed image. Second, even when used with Toshiba’s top-tier BDX5300 Blu-ray player, we noticed a fair amount of motion judder with vertical and diagonal motion (horizontal motion was quite smooth), but things got a little more dicey with detailed, 24fps images, even with the set’s “film stabilization” feature engaged. Finally, it seemed to us as if the LED backlights were a little slow to go from their darkest to brightest settings. We noticed a few times during our evaluations when content would go from all black to a full-screen, highly bright image that it took a little longer than we’re used to for the LED’s to fully ramp up. Toshiba set out to provide a large, premium-quality picture backed with its recognized name in a TV with an accessible price tag. In that regard, the 50L5200U succeeds. However, a number of trade-offs were made in order to bring the price-point down and some of those have the set feeling a little cheaper than we’re used to with Toshiba. We don’t mind the exclusion of 3D or 240Hz motion smoothing — and we can even get over the lack of Internet connectivity, considering so many other devices provide that feature, but a cheap-feeling stand, dated remote design and watered-down interface could be off-putting to those that shop with their hands as well as their eyes. Still, this TV makes an excellent solution as a wall-mounted, everyday watching TV and the price ain’t too shabby, either.